It seems that I'm tending to blog about once a month at the moment so I'll run with that for a while and see how it goes. I'd love to blog more often but I guess it's just not meant to be. Still, here I am. So, first up is an FO that I'm particularly proud of. Remember this from January? It looked a little frumpy hanging in the tree all by itself so I tarted it up with a colourful scarf and it made all the difference! It looks great with jeans (and no, I don't have a pic of that) and is super warm. 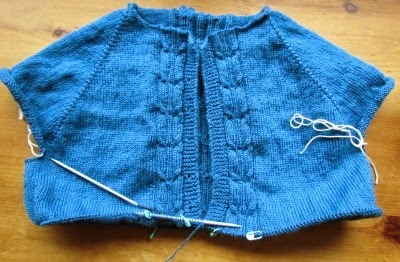 It's Minetta by Kirsten Kapur and is a really easy and enjoyable project. I used a stashed 4 ply yarn (80% wool) which I suppose is going to be waaaaay too hot for even the coldest South African winter day, but even if I only wear it once or twice, it'll be worth it. Here's a back view which is equally gorgeous...love the centre cable panel! That panel stopped me from committing suicide whilst doing the back which is how I normally feel when doing endless stocking stitch! Enough to keep it interesting but not enough that I couldn't watch TV or listen to audiobooks at the same time....perfect. And a view without the scarf. (Please excuse the shoulders ... there are NO shoulder pads (I'm not that desperate to replicate the golden age of the 80s, although it was the greatest decade of all time) - it's just the hanger I was using! And so, onto another FO!!! For a while now I've been wanting to try Tunisian crochet. However, until recently my local yarn shop didn't stock the hooks and I wasn't about to embark on an internet shopping spree because it never stops at one item does it ...... or is that just me? However, I managed to lay my hands on a hook a few weeks ago and decided that today was the day to make something useful. A month or so ago I was given these rather wonderful things. They're called Snippits here in SA - and they are totally FAB! For us crafters, scissors can be a bit of minefield. Some are too big to carry around in a little "bits and bobs" bag, some are too small, made in China and fall apart after about a week so we're always on the lookout for the perfect cutting tool. Well, I think I've found it with these little beasties cos they're perfect. I know they look a bit antiquated and when I first saw them I was reminded of some of the lethal hardware that my grandfather used to keep in his shed, but believe me, these are The Business. They are extremely (and I don't use that word lightly) sharp and have a point on them that could make a grown man weep. They are small (just over 2") and feel great in the palm of my hand. Being almost flat, they allow me to cut yarn really close to my work which means I don't get those little tails sticking out all over the place. A perfect Snippit Sleeping Bag! And here are the Snippits all tucked up with points end in first (again, so I don't stab myself)!!! An excellent way to spend a couple of hours! And that's pretty much it for now. I have started my next project which is Rustique by Glenna C. I'm doing it in a forest green tweedy sort of yarn which I love so I should have that finished by next time!